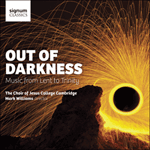 James MacMillan is a Lay Dominican and a very large proportion of his output has been inspired by his Catholic faith. Sedebit dominus rex is the seventh of the first set of fourteen communion motets—accessible in style and of only moderate difficulty—composed for Strathclyde University Chamber Choir between 2005 and 2010. He has composed three sets of these so-called Strathclyde Motets to date. In the opening section of this motet for the Feast of Christ the King the incisive soprano line shows the influence of ancient Celtic music, another area which has provided MacMillan with a rich source of inspiration. the Lord will bless his people in peace.